AIS+ is an application for receiving and sending AIS ASMs using a user-friendly user interface. The software can be run on a normal PC connected to the AIS transmitter through the Pilot plug. AIS+ reads AIS messages from the serial or USB port of the computer, decodes them and visualises the information content. It also codes user inputs into AIS ASM messages and sends them to the AIS transmitter for transmission. 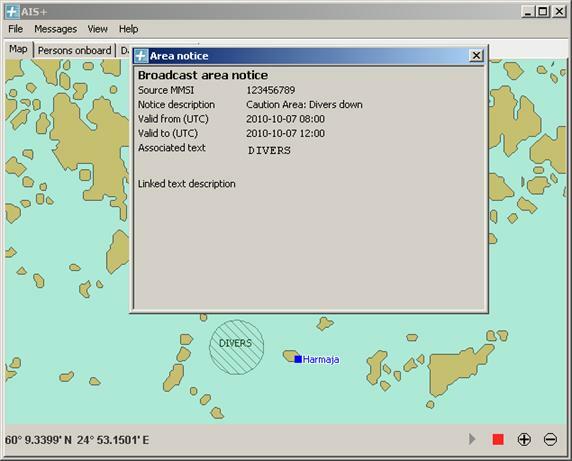 The ASMs currently implemented in AIS+ are: Meteorological and hydrological data (FI = 11, FI = 31), Area notice (FI = 22 and 23) (receiving), Number of persons on board (FI = 16), Dangerous cargo indication (FI = 25) and Area notice (sending) , , all defined under the international designated area code (DAC = 1). The map view shows the vessel’s current own position with a black circle. The location information is retrieved from the vessels own position report AIS messages and the map by default follows the vessel. The map also shows major place-names and lighthouses depending on the zoom level of the map. AIS+ can be used to create area notices consisting of a single geography type, i.e. circle, rectangle, sector, polyline or polygon. The area notice specification in the IMO circular SN.1/Circ.289 allows a combination of these in a single message but that is not currently implemented. 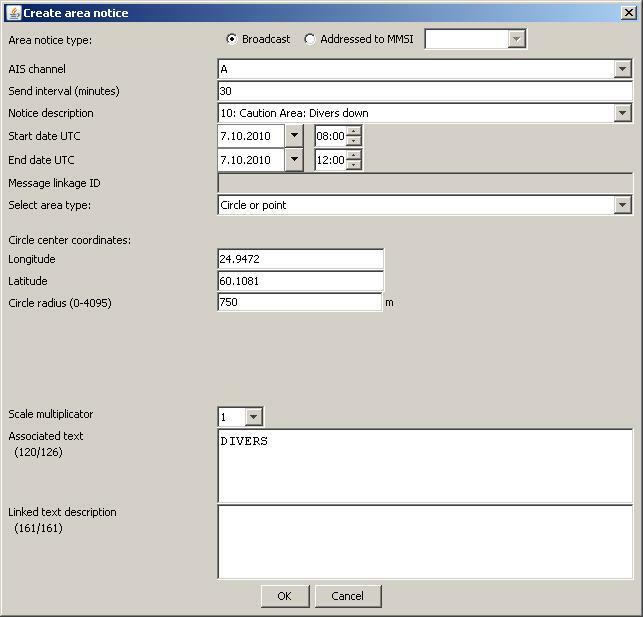 The area notice creation dialog in the figure below shows the fields that can be filled for the area notice, depending on the selected area type. The area can be drawn on the map with a few clicks and for circles, rectangles and sectors the location parameters can also be tuned manually in the dialog. The resulting area notice is shown in the figure below with an opened area notice information dialog. Here the map is zoomed to the best coastline resolution (40 meters). – Additional information is received by clicking the symbol. – Integrating with existing ENC symbology is desired.